Appearing weak, the group sat in wheelchairs in front of the home of Yale President Peter Salovey after knocking on his unanswered door. Aaron Greenberg, chair of Local 33 - Unite Here and one of the fasters, said he's tired, but not ready to give up. "I’m willing to take it as long as it makes sense for me personally and medically," said Greenberg. "We’ve been checking in with nurses everyday." 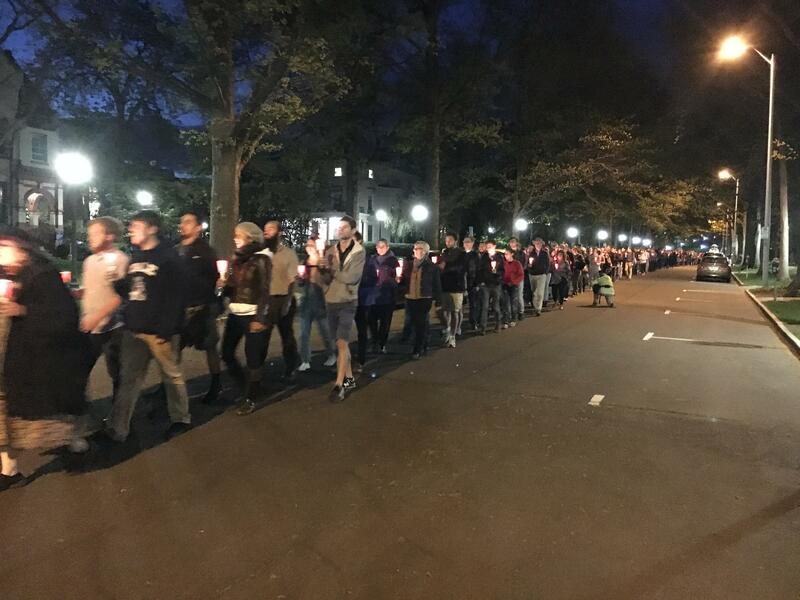 Supporters join Yale graduate teachers for candlelight vigil marking one-week of fasting. More than 100 supporters holding candles marched silently behind the grad students as they were led away in wheelchairs. In a statement, Salovey said his primary concern is for the health and safety of the students. He urged them to reconsider taking actions that could be harmful to their health. Some students, who disagree with the protesters, recently held a barbecue nearby. But the fasters said overall they've received a lot of support, including a surprise visit from singer-songwriter Melissa Etheridge, who stopped by before her performance Tuesday night at College Street Music Hall. Yale University is making the transition from Calhoun College to Grace Murray Hopper College. Although the name change won't be official until July 1, changes are underway at the residential college, including a plan to replace a number of stained glass windows to better reflect the legacy of Grace Hopper.